"Evidence has been received at these headquarters that Maj. Gen. Sterling Price has issued commissions or licenses to certain bandits in this State, authorizing them to raise "guerrilla forces," for the purpose of plunder and marauding. General Price ought to know that such a course is contrary to the rules of civilized warfare, and that every man who enlists in such an organization forfeits his life and becomes an outlaw. All persons are hereby warned that if they join any guerrilla band they will not, if captured, be treated as ordinary prisoners of war, but will be hung as robbers and murderers. Their lives shall atone for the barbarity of their general." Heady stuff, and clear that guerrilla activity would not be accepted by Union forces in the state of Missouri. 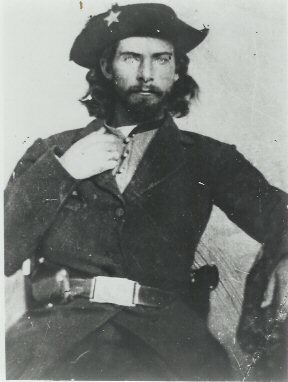 Brigadier General Schofield, Commander of the Department of Missouri, created the Enrolled Missouri Militia in July 1862 in a further effort to thwart the guerrilla activity. The Militia was considered a part-time force, called in to duty for emergency and garrison-type policing duties. Its formation then freed Missouri State Militia troops to actively hunt the guerrillas. Jesse C. Turnage enrolled in the Enrolled Missouri Militia October 2, 1862. The story goes that on 18 July 1864, 2LT Turnage was on leave and working in his fields in Ray County, Missouri. "Bloody Bill" Anderson and his gang of guerrillas came upon Turnage, and knowing his role in the Militia, tied him up and interrogated him. Anderson then decided that Turnage would die and a member of his gang cut the Soldier's throat. The story continues that the gang then went to the Turnage family home and forced Turnage's wife, Esther, to make them food. William T. Anderson, known as "Bloody Bill"
"On the 18th they [guerrillas] passed northwest of Richmond, about seven miles from the city, murdering Lieutenant Turnage, of company D, Fifty-first Regiment Enrolled Missouri Militia...Lieutenant Turnage was shot three times in the head and his throat was cut from ear to ear." So the story is true and more gruesome than I was aware of. I have yet to determine the validity of the guerrillas then forcing themselves into Turnage's home. While the above is not conclusive proof that "Bloody Bill" Anderson was actually involved, it does show the savage nature of the Civil War in in the state of Missouri. The fact that it was attributed to Anderson also shows that, while it may not be fact, it was definitely an example of his modus operandi and an example of how he earned his terrible moniker. Sources: Maj. Gen. Halleck's General Order #2: The War of the Rebellion: a Compilation of the Official Records of the Union and Confederate armies. ; Series 1 - Volume 8, pages 611-612. Joseph Black report to Brig. Gen. Fisk: The War of the Rebellion: a Compilation of the Official Records of the Union and Confederate armies. ; Series 1 - Volume 41 (Part II), page 252. I came across your page while doing some research on my own family history. 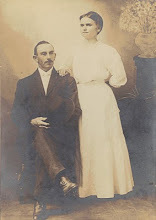 Jesse Turnage is my 3x great grandfather. I found a brief story on Find A Grave about his murder which led me to a Google search. Thanks for your post and reference. Chris, I'm late in responding, but I appreciate your kind words. Best of luck in your research...let me know if you find anything new!